When I first heard of BPA and the dangers it poses, I was about 22 years old and my awareness of the problem and the extent of my concern was my water bottle. At the time I had a good friend who worked at an outdoor equipment shop and he assured me that my exposure was so minimal it would take a lifetime for it to affect me. This half settled my nerves, but I still found myself seeking out items labeled “BPA-free” because it seemed to me that unnecessary exposure to a known toxin didn’t seem right. Since then, we’ve learned a lot more about the extent of the damage possible because of BPA exposure and absorption. And just how much exposure we really encounter, largely unknowingly. Bisphenol A (BPA) is a man-made compound used in polycarbonate (hard)plastics like water and baby bottles, household equipment, toys, and tin cans. And it’s also used to make ‘softer’ products like PVC. It’s a key component in the epoxy used to make things “nonstick” and/or anti-corosive, medical supplies and materials, and dental resins and sealants. It’s been used for over 50 years in consumer products, and only recently have they started pulling this chemical out of certain items. BPA has actually been suspected of being hazardous to humans since 1930. Recently, though it has grabbed headlines when studies started coming out showing there may be a problems. See, BPA has been shown to be toxic even at low doses. And one of the main problem with it is that it’s an endocrine disruptor. Meaning that even at low doses it can interfere and mimic your bodies own hormones, causing adverse health effects. Not something you want going on while trying to conceive! The saddest part is, it’s most damaging to developing babies! While their reproductive organs are being developed in utero, these hormone disruptors can wreak havoc and cause future problems for these poor little babes. BPA mimics estrogen and can bind to estrogen receptor sites. This negatively influences many processes throughout the body, including cell repair, energy, fetal development, and reproduction. Because it mimics estrogen it can and often does affect other glands, especially the thyroid and its receptor sites. This is incredibly alarming, given how pervasive BPA is. This chemical can be found in countless items. In our modern society, we are exposed to BPA many times throughout a day. Japanese scientists have found that women with Poly cystic Ovary Syndrome actually had higher serum levels in their blood than women with normal ovary function. So, like the chicken and egg question – does BPA help cause PCOS symptoms, or do PCOSer’s just unable to eliminate toxins as effectively? A March 2015 study showed that high concentrations of BPA inhibited sperm motility and motion kinematics by significantly decreasing ATP levels in spermatozoa. The evidence of another 2015 study shows that BPA can interfere with endocrine function of hypothalamic-pituitary axis, such as by changing gonadotropin-releasing hormones (GnRH) secretion in hypothalamus and promoting pituitary proliferation. Such actions affect puberty, ovulation and may even result in infertility. 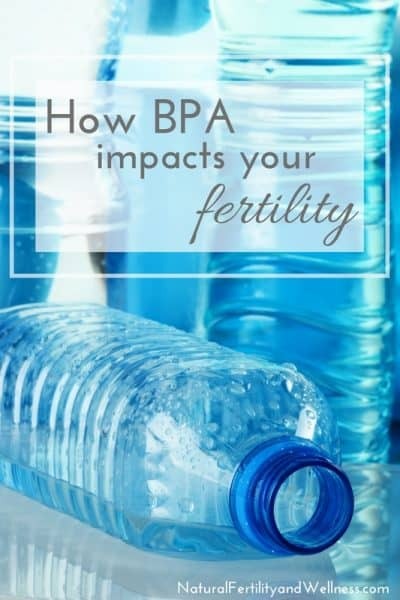 Ovary, uterus and other reproductive organs are also targets of BPA. BPA exposure impairs the structure and functions of female reproductive system in different times of life cycle and may contribute to infertility. Both epidemiological and experimental evidences demonstrate that BPA affects reproduction-related gene expression and epigenetic modification that are closely associated with infertility. 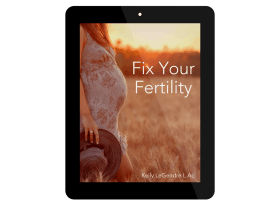 The detrimental effects on reproduction may be lifelong and transgenerational. Now, if you’re at all like me you’re probably feeling a little overwhelmed. Like, how is this true? How could I possibly avoid all of these things? As with most things, health and healing is about doing what we can do with the resources we have. Pick a few things that strike you as do-able, or that you recognize are big exposures for you and your family. Let’s break it down a bit. When possible avoid #7 and #3 plastics. These types of plastics seem to contain BPA more than the others and allow the chemical to leach into your food or beverage. Also, do not reuse containers that are meant to be disposable. Avoid putting hot food or liquids into plastics. When heated, BPA can leach out 55 times faster than the normal rate. Limit canned food consumption. You’re thinking “a can isn’t plastic!” Right? Well, to keep the chemicals of metal cans from leaching into our foods, they line them with – you guessed it, a liner that includes BPA. So try to buy food in glass jars and not cans. (canned soups and pasta sauces seemed to have the highest amount) Although the underside of the lids in glass jars may contain BPA as well, but exposure may be minimal since the product is not in constant exposure to a BPA lining. Try not to use plastics in the kitchen, and at least never for warming up foods. Place hot foods on glass or ceramic dishes. Avoid old and scratched plastic. If it looks worse for wear – toss it out! If buying for baby – make sure you purchase BPA free bottles, sippy cups, and toys! And if you do have #7 or #3 plastics and can’t afford to replace them quite yet, make sure you don’t wash them in the dishwasher! The heat and detergent can cause more leaching. And while it’s an unrealistic thought that we can completely stay away from this chemical unless we nit pick everything we eat or drink out of, being aware of it can definitely decrease your consumption! Wow…thank you so much for this information! 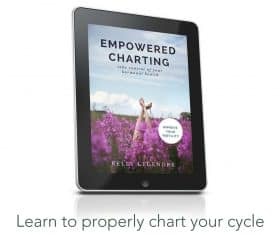 I found your blog during the Bloggy Giveaway and am sure I will learn a lot!